Rabbit meat used to be as common for dinner as chicken is today. My family and grandparents all grew up eating rabbit, and raising them in their backyards. It is the protein source that got many families through the tough times of the Depression, and in Europe, WWII, according to our surviving family friends. One of the reasons rabbits were such a gem is they were quiet and could be hidden from neighbors, to have a secret source of meat! A family could raise rabbits and nobody know they were there. 1. Rabbit is one of the best white meats. Being a mammal, it provides mammal-appropriate building blocks (such as tendons) that chickens do not, for those with health problems like tendonitis. 2. Rabbits are not fed corn and soy, like chickens. Chickens are a nutritional desert. Commercial rabbitries feed alfalfa pellets with some grain filler. At Trickster Hares Farm, we feed alfalfa pellets, a little barley, grass hay, and all of our vegetable scraps, yard trimmings, vegetable garden plants, harvested grass from the pasture, and vegetarian restaurant leftovers. 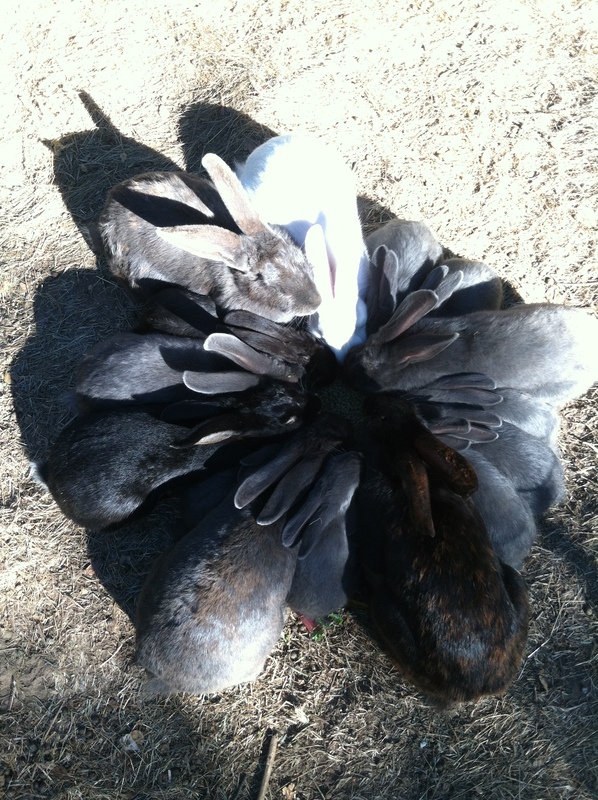 Our rabbits eat well! They have a varied diet rich in different sources of nutrients. Oh, did I mention we pasture-raise as many as possible? Green growing grass is their natural food source, increasing their nutrition, just like cattle and sheep. We’ve likewise planted food crops just for them, such as mulberry trees and apple trees. 3. The meat has a high percentage of easily digestible protein. 4. Rabbit is very lean, containing the least amount of fat among all the other available meets. 5. Rabbit meat contains less calorie value than other meats. 6. Rabbit meat is almost cholesterol free and therefore heart patient friendly. 8. The sodium content of rabbit meat is comparatively less than other meats. 9. The calcium and phosphorus contents of this meat or more than any other meats. 10. The ratio of meat to bone is high meaning there is more edible meat on the carcass than even a chicken. 11. Rabbit meat does not have a strong flavor and is comparable to chicken but not identical. I personally find rabbit “fills me up” on less that the amount of chicken I have to eat to feel satisfaction. Rabbit does well with all your favorite chicken recipes. 12. Rabbits are one of the most productive domestic livestock animals. Rabbits can produce 6 pounds of meat on the same feed and water as it takes a cow to produce 1 pound. That means a lighter footprint on the planet! Thanks to Rise and Shine Rabbitry for some of the facts in this post! i am trying to decide how i am going to humanely dispatch them… i watched a lovely woman from texas who very movingly butchered her buns… but i haven’t been able to yet. …not even the bitey one. I just saw your post… did you figure it out? I’ve heard the Rabbit Wringer is the easiest method. I haven’t gotten one we use the broomstick method. After offering a ritual and blessing which helps them prepare for the transition. They’re usually calm and go easily after the ritual (plus its important we are calm and centered, they pick up on that). Pretty much everyone gets some flak for raising meat rabbits because they think they’re cute, what they don’t realize is 80% of rabbits don’t make good pets and aren’t sweet, and would sooner bite or scratch than be held. And what they don’t realize is how incredibly cute cows, lambs, and chicks are too. All animals are cute. It doesn’t mean they all make good pets. And, cute or not cute, we’ve got to eat to be healthy and alive. This is somewhat irrelevant, and false. Dietary cholesterol has a minimal effect on serum cholesterol measure, either the measured total and amount in HDL particles, or calculated values as in that carried by Non-HDL particles (VLDL, IDL, LDL, Apo(a)). Every cell membrane contains cholesterol. It is especially important for growing brains. About 75% of serum cholesterol in synthesized in the body, mostly in the liver, though ALL cells can synthesize it (however the gonads and adrenal glands primarily use cholesterol from the liver to make steroid hormones). If breast milk is deficient in cholesterol, the infant’s liver will make it. If the breast milk is rich in cholesterol, its liver can devote resources to other tasks. If dietary cholesterol is LOW, then the intestines will reabsorb most/all the cholesterol from bile. If dietary cholesterol is HIGH, then most of the bile cholesterol will be excreted in the stools. Cholesterol is as important a molecule to human health as is water. It is only those who make “LDL-cholesterol lowering” medications (i.e. statins) that think reducing cholesterol is a good thing. Low cholesterol is actually associated with increased all-cause mortality, and reduced longevity. Insulin signals cells that nutrients are available for cell division and growth. Growing cells need lipids, including cholesterol, for making cell membranes. Carbohydrates raise insulin most, more than protein does, and so a starchy/sugary diet stimulates hepatic cholesterol production. Rabbit meat is “heart healthy” because it is low in carbohydrate, not because it is low in cholesterol. Hi J., thanks for writing in. The science behind food and nutrition changes by the year it seems, and I agree with you that at this point they are saying cholesterol is not the culprit. (this is an old post, so it’s previous research.) Since it’s such a complex topic, and in my books, not enough accurate research is done, mostly because they keep researching individual components instead of how all the components in food act together. That’s why many multi-vitamins and supplements are bogus – they’re ineffective as isolated components, but work great when actually in food itself, when food is high in nutrition using organic methods, instead of typical factory raised meat sources fed on corn and soy, or plants raised on chemical fertilizer. If we look at the organism as a whole, and food as a whole, we have a different experience, and treating an organism such as our body holistically taking all the factors in, including nutrition, exercise, sleep and mental well-being is going to have the greatest impact on our health. Speaking about food sources, and what qualifies as nutritious, I appreciate Michael Pollan’s take on food, that we should eat what our grandparents recognize, and to shop in grocery stores only in the outer ring of the store – fresh fruits, vegetables, dairy, meat, but seldom to never packaged foods. However, I can’t agree with you on the carbohydrate bit. Meat contains very little to none, regardless of source of meat. The lack of fat in rabbit probably accounts for the increased health benefit, for those who need to avoid animal fats. Some people actually need the fats, so even animal fat is not the bad guy people once thought it was. Depending on a person’s health and circumstance.